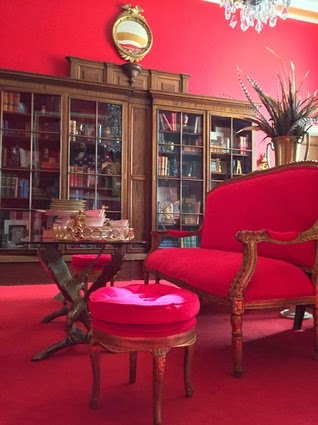 Chic on a Shoestring Decorating: Congressman Aaron Schock's "Downton Abbey" Inspired Office... or is it? 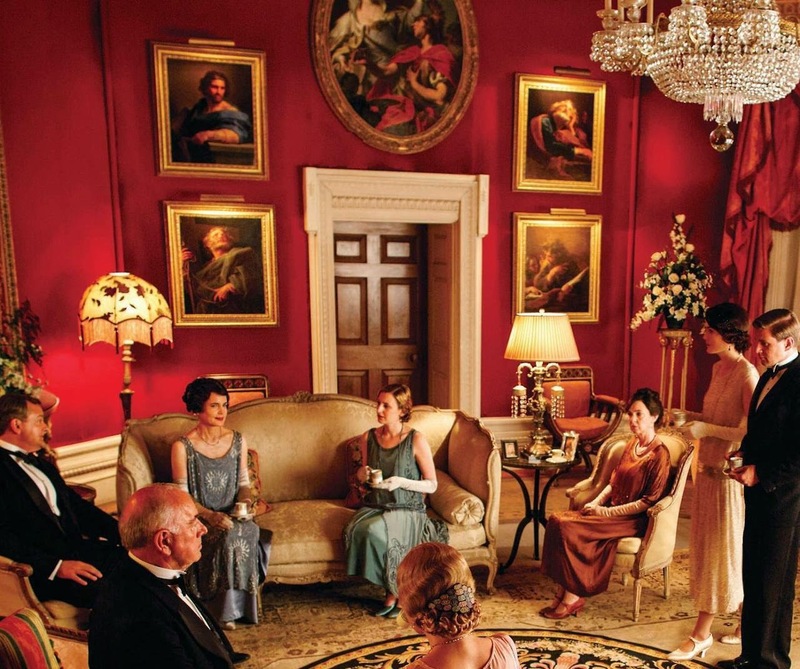 Congressman Aaron Schock's "Downton Abbey" Inspired Office... or is it? You guys, I might have the coolest congressman ever! 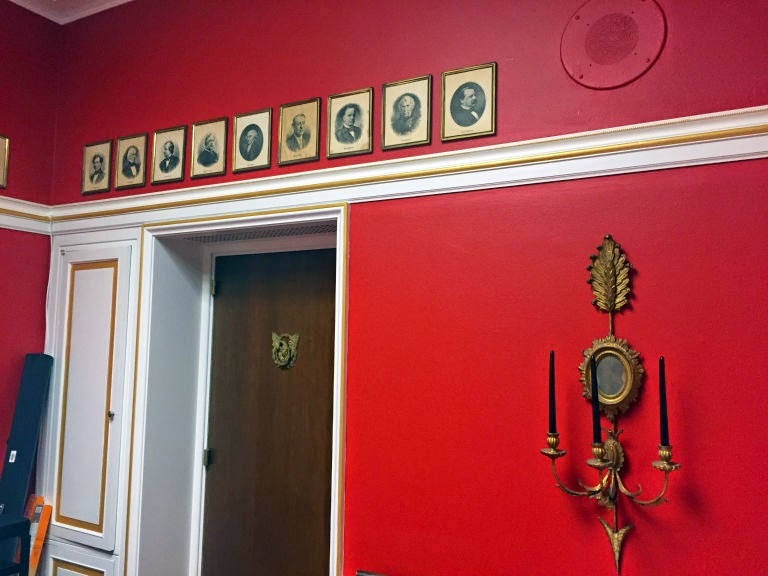 My congressman of my district has this fantastic "Downton Abbey inspired" office. WOW! It is pretty awesome in a very stately sort of way. 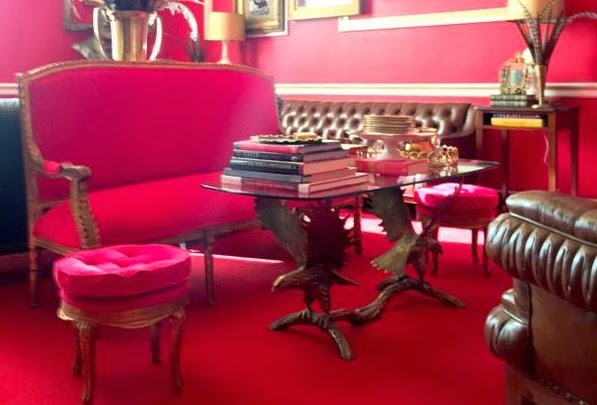 While I am not usually a fan of red rooms (they remind me of early 00's dining rooms) this red room is killing it. 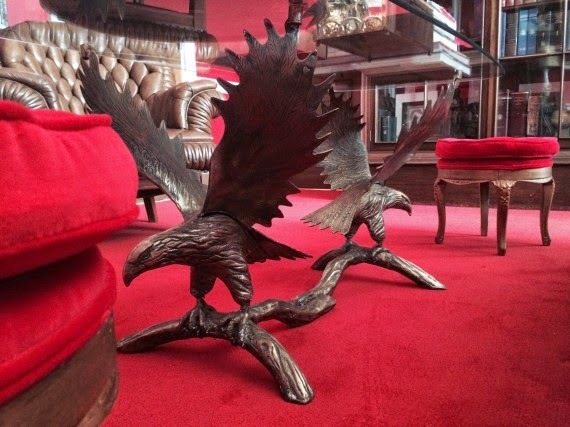 The pair of bronze bald eagles holding up the glass table top is very stately and masculine. 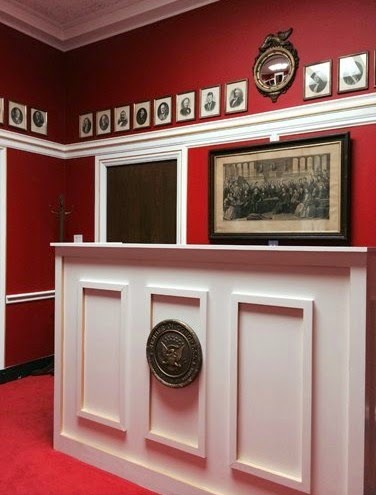 It makes perfect sense to be in a congressman's office as it is such a strong symbol of America. Anywhere else it would be... well, weird. The dark tufted leather sofa and chairs are also very masculine and balance the red velvet settee nicely. I really like the modern take on the gallery wall. Some large gilded gold frames amongst the white paneling trim and random sized portraits of past presidents. 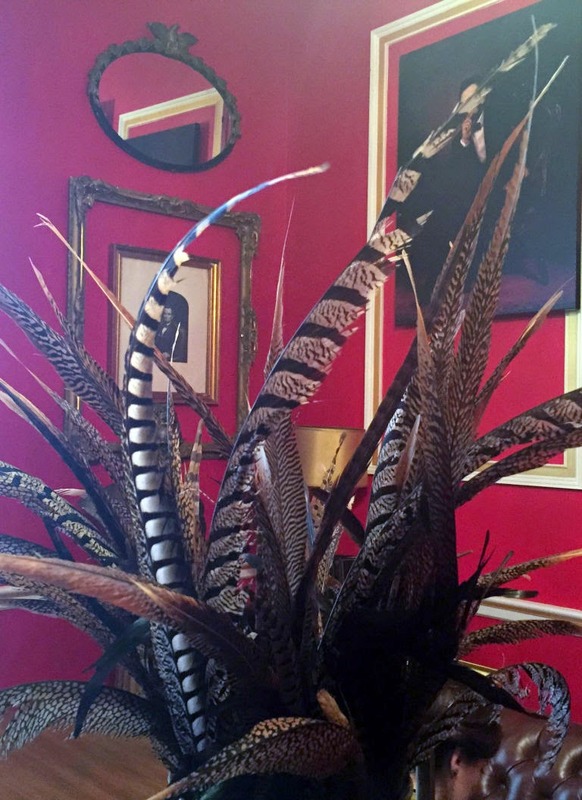 People are fussing over this vase of pheasant feathers (someone even said they were peacock feathers, duh. insert eye roll here) but they are on trend. Can you imagine if there were fake flowers in there instead... yuck! 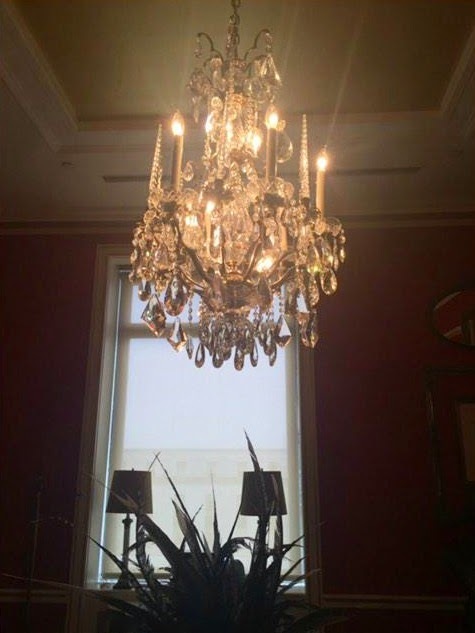 Ohhh this chandelier... it is blinged-out and a tad gaudy but I love it. It works perfectly in this space. 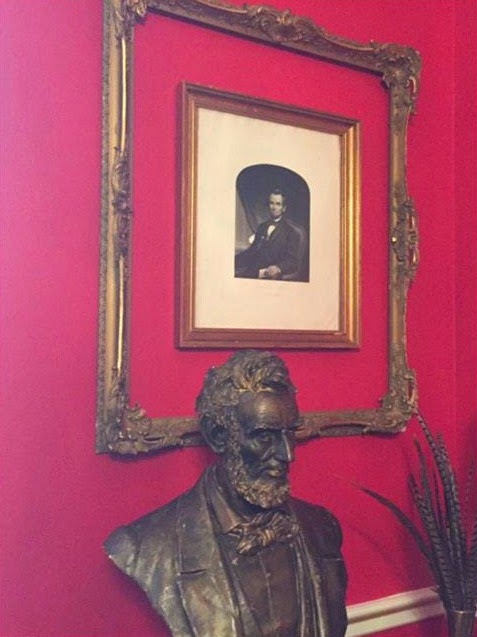 And, what good Illinois congressman doesn't have a bust of Abraham Lincoln in his office? Right?! Illinois' state slogan is the "Land of Lincoln" in case you didn't know. It's double Abes in this little vignette! (and a few more feathers in the corner). 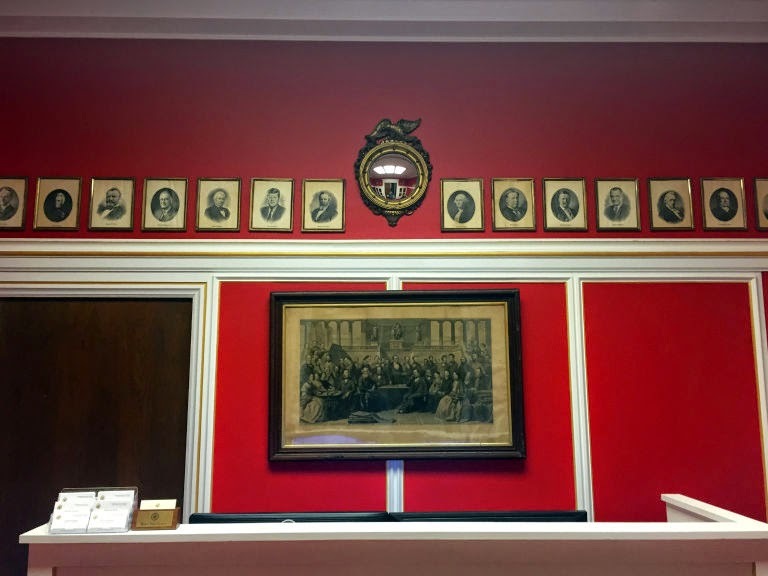 In the front office area you are greeted with an illustration of the signing of the Declaration of Independence and more pics of past presidents (and others I've come to find out) plus a nice stately desk. The official looking seal on the desk is from the congressional gift shop. 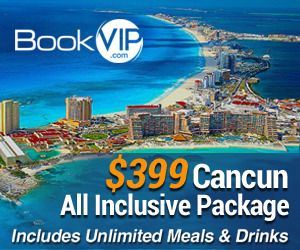 Probably not very pricey but look professional and interesting. And here's another view. I'm digging the gold candle sconce. Anywaaaay, if you haven't heard there is a little bit of controversy about this office and if it was "paid for with appropriate funds" and "why won't Congressman Schock talk about it?" and blah, blah, blah... It's been getting some very negative press. Being that he is my congressman and I'm into design (and Downton Abbey for that matter) I was very intrigued by all of the "news" stories surrounding his office decor so I've been following along. As politics usually go, the other party is throwing punches at Congressman Schock for anything "suspicious" that they can get their hands on. 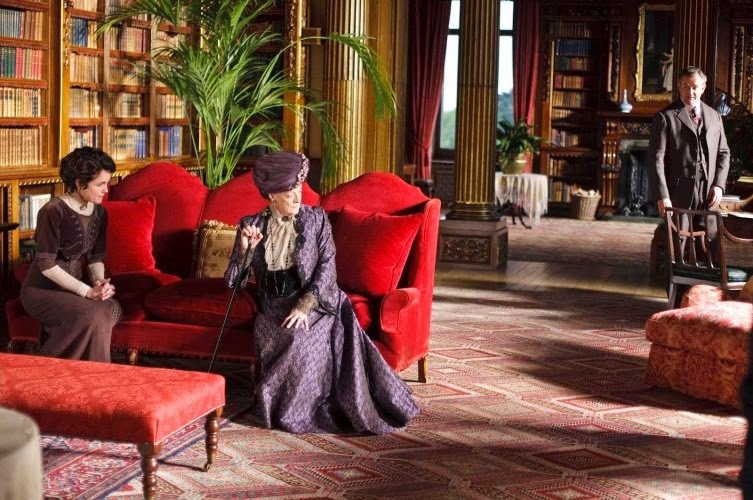 This time it's his "over-the-top Downton Abbey office". 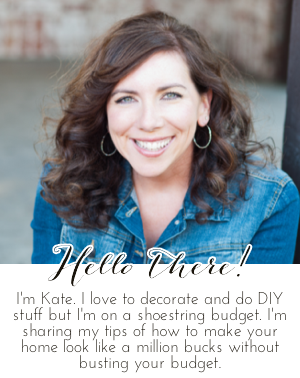 Annie is a decorating girl after my own heart, she did this place on a budget and it looks like a million bucks! She bought stuff at TJ Maxx, and that stately white reception desk, it's made out of some 2x4's and a cheap pre-fab work bench from Home Depot. Instead of buying pricey antiques she hit flea markets and junk sales. That fancy eagle table only set them back $175 and it was one of the most expensive things purchased for the office. 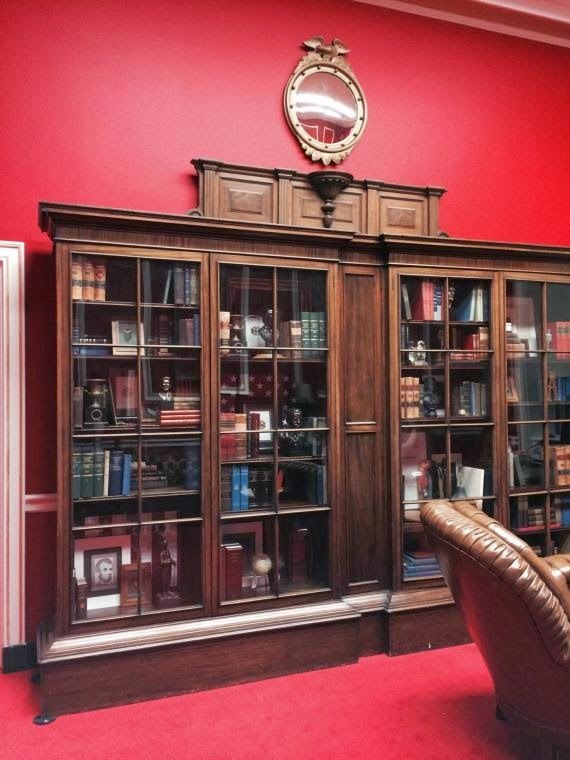 Most of the other furniture was from the congressional stash. Apparently, they have a huge stockpile of furniture from when members move in and out or switch offices. She got all of the leather couches and this grand (very Downton Abbey-ish) book case from the stash. So, about the office being inspired by Downton Abbey, Brahler says in an interview with Huffington Post, "it was not the design inspiration. If it was, I’d happily admit that. And I’m flattered that people think that. But my inspiration did not come from that show." On how she chose the colors and design she says, "I knew Aaron. I knew that he was young and really open-minded, yet conservative. I also knew that his work ethic was something that was a real inspiration to me. You know, the Midwestern work ethic is kind of unmistakable. I wanted Aaron’s constituents to know when they walk into his office what kind of person he is. Especially that he has this high energy." I totally get this. I get that he is really young to hold this office and that the designer wanted to convey his high energy through color and design. I get that he is not a beige and bland office kind of guy, he is not boring, he is not your typical congressman, so why should his office be? But, c'mon. It totally looks like it's inspired by Downton Abbey. Look at that red velvet sofa. And those bookcases. Straight outta Downton Abbey library. Although, most are comparing it to the red room. Looks a bit like that one too. A little over the top? For a congressman, maybe. But, if he didn't do anything wrong, meaning he paid for it himself, then who cares? I am one of his constituents and I don't care. I think this is much ado about nothing. I say props to Congressman Schock for doing something different. Props to him for hiring a budget-friendly decorator from downstate Illinois and not some fancy DC (or Chicago) design firm. Props to him for not caring what everyone else thinks. If he didn't break any laws, and I don't think he did, then more power to him. I think it looks amazing. I think that those who protest something like this have a great deal more to hide than the protested (is that even a term?}. Now if he had hired a large, Chicago based, in-your-face decorator and spent over a million; he would be touted as a forward-thinking, fast tracking politician on the road to success. Watch his detractors, their hands are probably very dirty. Wish more public figures did not just have their taste in their mouths! Please keep in mind that I do not live in your state and know absolutely nothing about his politics. Seems to me, that the powers that be are unable to find much about him to criticize. Love, love the room. I love this room! To me this says a politician who is willing to be himself and not try to be all things to all people on the surface and all about himself underneath. If he is willing to proclaim his personality so blatantly, then I'd trust he was speaking the truth. I'd vote for him!